If there is a reasonable number of candidates, it will lead to a more interesting campaign, and hopefully more publicity for UKIP. There are already two many candidates and it will get messy as it did last time. I wonder if Paul, Steve and Bob could comment on the fact that Gerard Batten's policy document on energy from October 2006 ( http://www.gerardbatten.co.uk/pamphlets/britainsenergy.pdf ) doesn't mention climate change, the defining issue of our age? Should a man who determinedly refuses to see any linkage between energy production and the climate lead a British political party? Gerard Batten mentions energy conservation in his paper, but it seems that UKIP supporters are viscerally opposed to technologies which reduce energy usage like energy-saving lightbulbs. 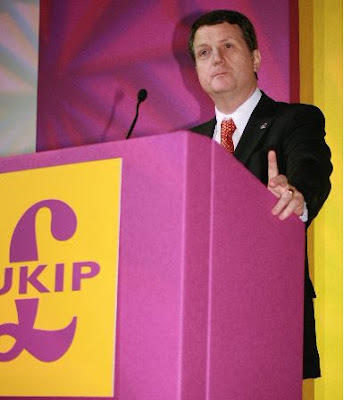 Could someone who supports Gerard Batten's plans for energy conservation explain how UKIP will implement its energy conservation plans without energy-saving lightbulbs?